The unlucky owner of this car was tagged on Charles Street last March. 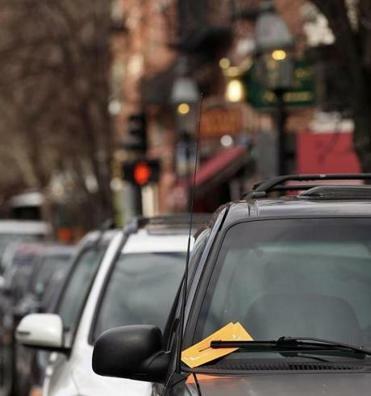 The city offers 13 tips for avoiding tickets. Beacon Hill leaders have promised to hold a robust debate on the state’s long-ignored transportation finance crisis in 2013. Legislation last June that authorized emergency short-term funding for the ­MBTA to avoid even sharper fare increases and cuts in service put the ball in the governor’s court, calling on him by Jan. 7 to “develop and publish a long-term surface transportation financing plan” for Massachusetts. The administration has played it close to the vest but hinted that specific tax hikes to erase some of the red ink from the beleaguered transportation system will not come Jan. 7 but will instead be baked into Governor Deval Patrick’s state budget proposal. The Jan. 7 plan is more likely to detail the extent of the crisis and the state’s goals for transportation — and lay out different courses for getting there, such as how much various taxes, tolls, and fares would affect the bottom line. In a radio interview last week, Patrick essentially ruled out a plan to tax drivers for their miles traveled, one option raised as a possibility earlier this year. “I don’t have a mileage tax on deck,” Patrick said during his monthly appearance on WTKK-FM, adding “the only thing that I am certain we will do” is move to all-electronic tolling for efficiency on the Massachusetts Turnpike, first reported earlier this month. Framing it more as a matter of priorities, he talked about his vision for a modern transportation system that would support economic growth and quality of life statewide. “That has got to go beyond patches and plugs” in the annual operating budget of the MBTA, he said, noting his hopes to expand the Green Line to Somerville and Medford, extend the commuter rail to New Bedford and Fall River, and even bring the commuter rail to Springfield, as well as improve regional bus, airport, and commuter boat service. Noah Bierman of the Globe staff contributed to this report. Eric Moskowitz can be reached at emoskowitz@globe.com.